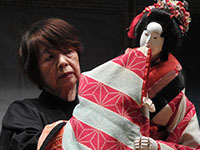 Tonda Puppet Troupe, founded in the 1830s, is one of the most active groups performing traditional Bunraku puppetry in Japan, and has been officially designated an Intangible Cultural Treasure. The Tonda Troupe has been active in training American college and university students in traditional Japanese puppetry in academic programs. During their tour of the Upstate, the Tonda Troupe will perform at Clemson University, Furman University, and USC Upstate.